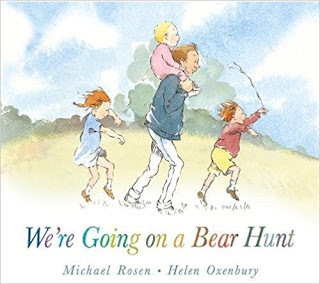 Although some people will only know We’re Going on a Bear Hunt as a picture book by Michael Rosen and Helen Oxenbury, the text is adapted from an American folk song and many children of my generation will have known it as a scout and guide campfire song long before the picture book was published. We’re Going on a Bear Hunt is one of the most celebrated examples of a picture book adapted from a song. 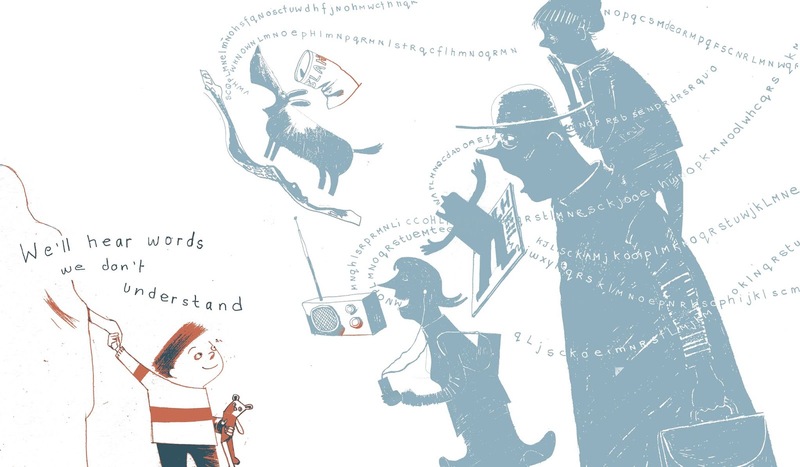 Song lyrics often need some authorial tinkering to make them work well as a picture book text and the onomatopoeic sounds in the book (Swishy swashy! Splash splosh! etc.) and the verses about the forest and the snowstorm are both Rosen's invention. 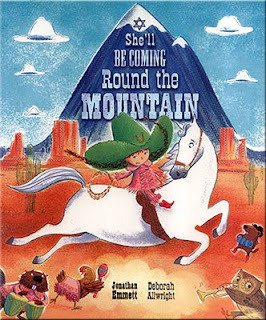 My picture book She’ll Be Coming ‘Round the Mountain, illustrated by Deborah Allwright, was also adapted from an American folk song. When an editor asked me to adapt the song a few years ago, I decided that the first thing I needed to do was reduce the repetition. While a degree of repetition is often encouraged in picture book writing, I felt that having the same phrase repeated five times on every spread would become a little tedious, so I replaced two of the repeated phrases in each verse with a rhyming couplet. I also replaced most of the folk song's later verses – including the ones about sleeping with grandma and killing the old red rooster – with new verses. 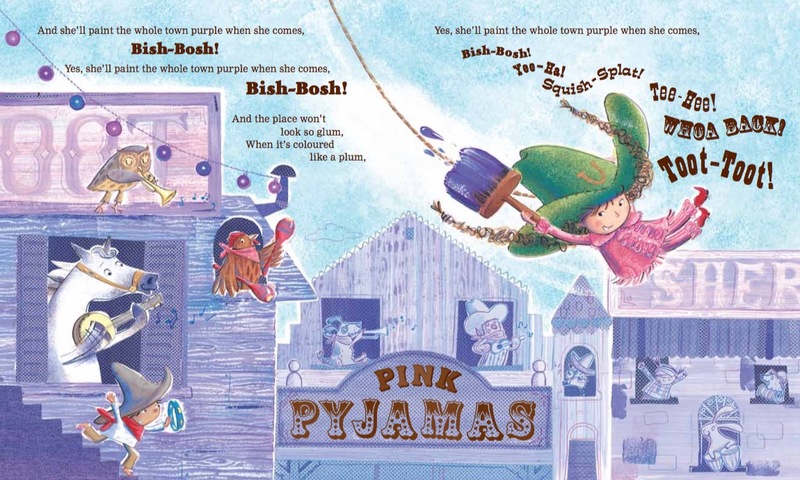 The new verse where the cowgirl paints the whole town purple was a cowboy-hat-tip to the Clint Eastwood western High Plains Drifter, in which an enigmatic cowboy literally paints a whole town red. One of Deborah Allright's spreads from She’ll Be Coming ‘Round the Mountain (now out of print). … but there are also quite a few adaptations that have been re-written to include a more exotic, mechanical or flatulent cast of characters. While all of the above examples are adapted from folk songs, picture book adaptations of contemporary songs have become increasingly common in recent years. 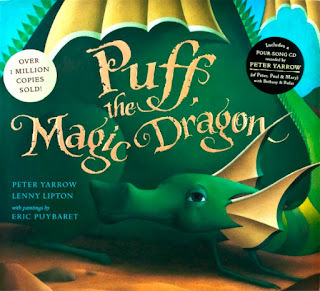 One of the first examples I remember seeing is this 2007 adaptation of the Peter Paul and Mary song Puff the Magic Dragon illustrated by Eric Puybaret. 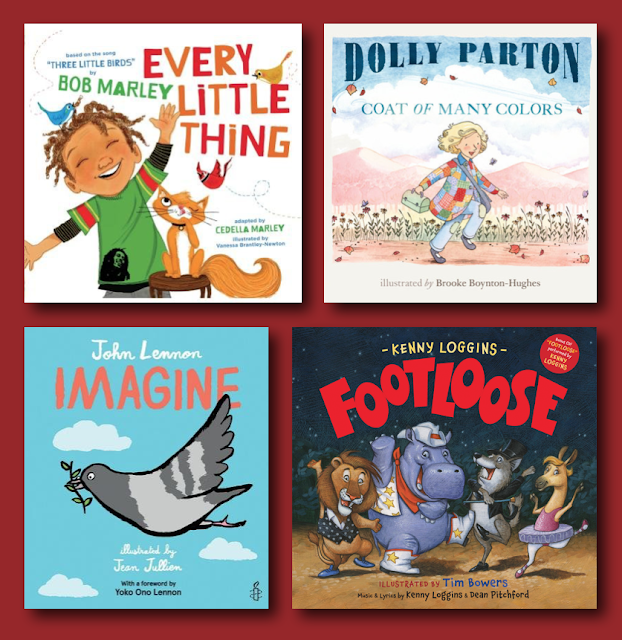 Since then, contemporary songs by Bob Marley, Dolly Parton, John Lennon, Kenny Loggins and many others have been adapted into picture books. Illustrator Tim Hopgood has produced a series of picture book adaptations of classic 20th Century songs. 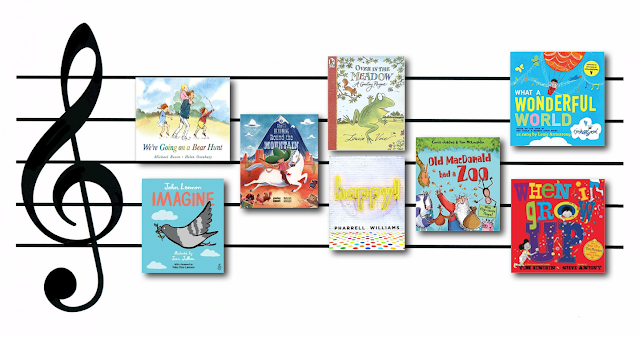 As picture books adapted from songs have become increasingly popular, the interval between the song coming out and the picture book being published seems to be reducing. 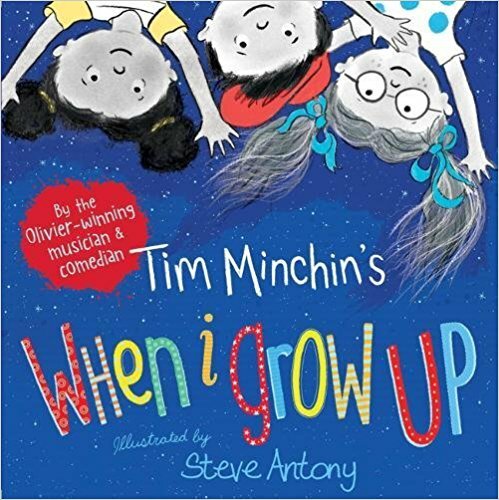 Last year’s picture book adaptation of When I Grow Up, illustrated by Steve Anthony, was published just seven years after the song first appeared, in Tim Minchin’s Matilda the Musical. 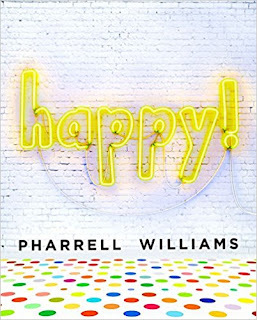 And the picture book version of Pharrell Williams’ Happy! 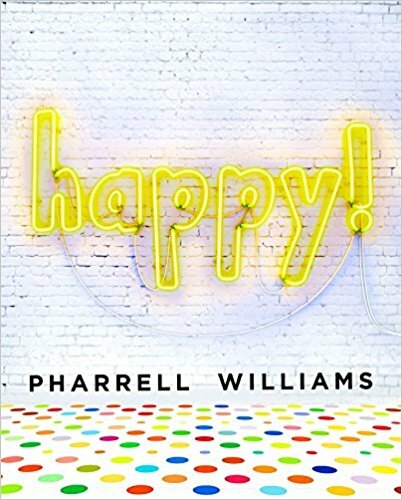 (illustrated with photographs) came out only one year after the song was released! 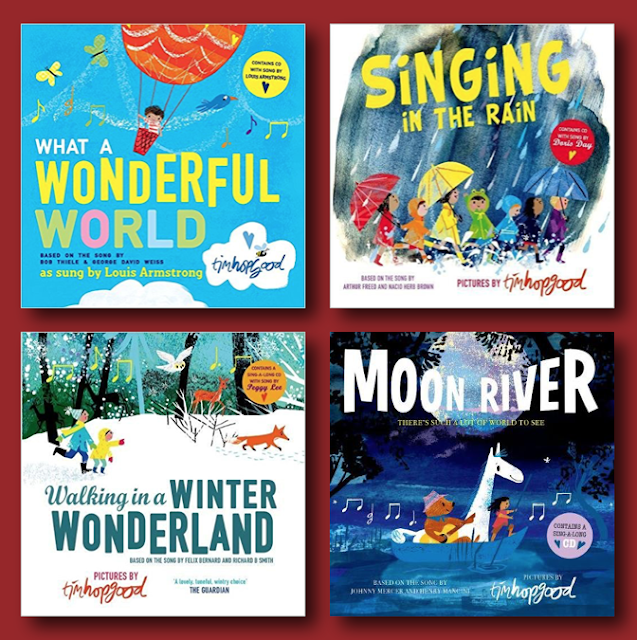 So if you’re a picture book author or illustrator looking for ideas, you might try flicking through an old songbook or switching on the radio. If you’re lucky, you might discover the inspiration for the next We’re Going on a Bear Hunt! 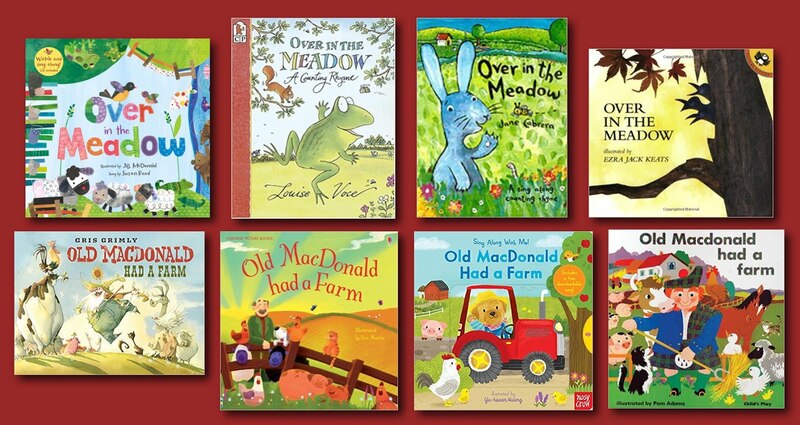 In the meantime, if you know of any good picture book adaptations of songs, do tell us about them in the comments section below. Jonathan Emmett's latest book is Alphabet Street, a spectacular lift-the-flap alphabet book illustrated by Ingela P Arrhenius and published by Nosy Crow. Although it's NOT adapted from the Prince song of the same name, it is written in rhyme and has all the makings of a toe-tapping global smash hit if anyone is interested in buying the song rights. 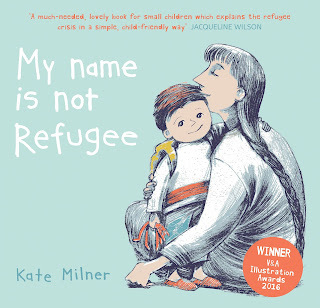 Huge congratulations to author illustrator, Kate Milner, who last week won the prestigious 2018 Klaus Flugge Prize for the most exciting and promising newcomer to children's book illustration. 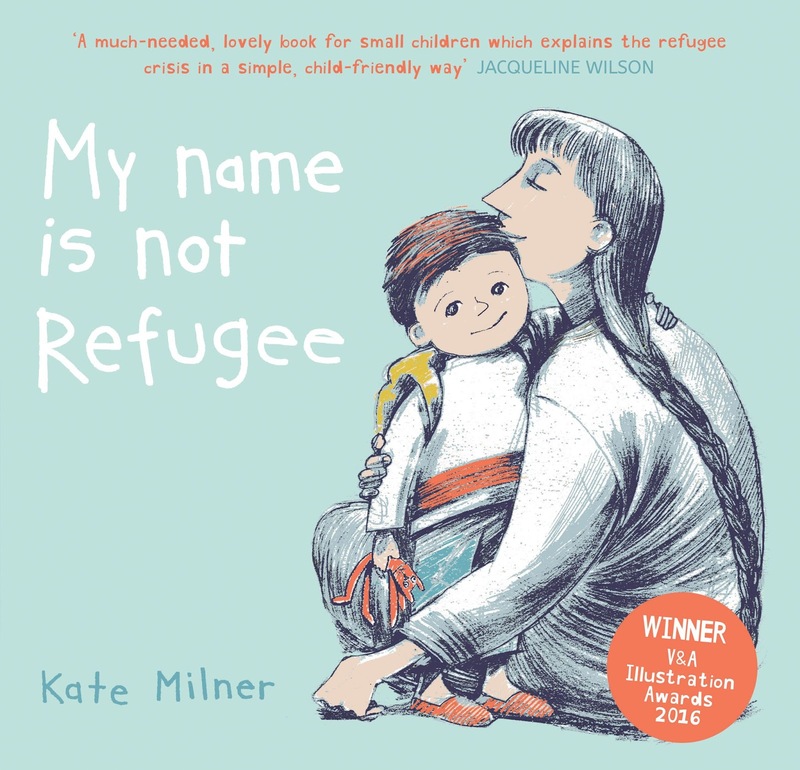 In her guest blog post, Kate takes us behind the scenes of her award-winning My Name is Not Refugee. We see illustrations that didn't make it into the final picture book, and discover why they were left out. When my job was replaced by a machine at our local library I decide to take the chance to do an MA in children’s illustration at Anglia Ruskin. I had wanted to do the course for many years but it felt like a huge risk to step out of the labour market when I had commitments. 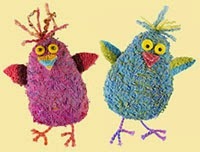 There was so much excitement and so much fear wrapped up in returning to education in middle age. 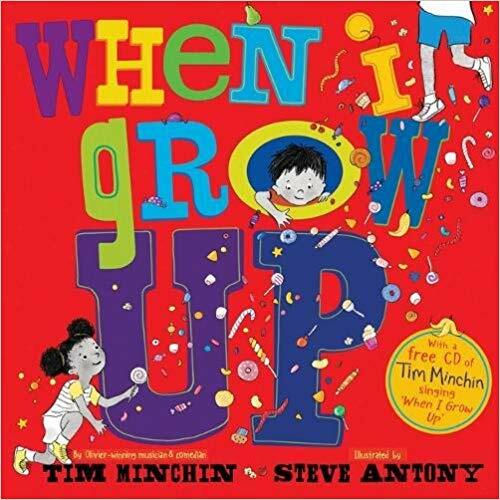 I had done some work in editorial illustration when I was younger and I have always drawn and written stories for adults but it was working in the local library which showed me all the possibilities in children’s publishing. I also, of course, met a lot of readers. It was an excellent education. I came up with the idea for My Name Is Not Refugee at the very end of the course when I should have been finishing off a piece of work for presentation. It was born out of anger at the debate in the press about the march of refugees out of Syria. They were being described as a zombie army, shuffling towards us, and it felt important to me to explain to children why these families had no choice but to leave their homes. It was crazy to start work on this idea a few days before the end of the course but that is what I did, presenting at the final crit a scrappy, half-finished picture book, with no cover. We all agreed it had no chance of commercial success. All the steps which have taken me from that crit to winning the Klaus Flugge Prize feel as if they are nothing to do with me but all the wonderful tutors, fellow students, agents and publishers who have picked it up and run with it. When people congratulate me I always say that I have been very lucky. 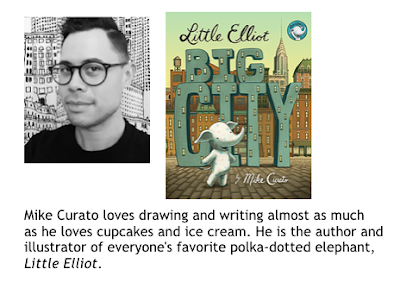 Being polite they generally then say something like, not luck but talent; but, without any false modesty, I know that it takes collaboration to get a book into the hands of children and I have been very very lucky in my collaborators. that did make it into the final book. 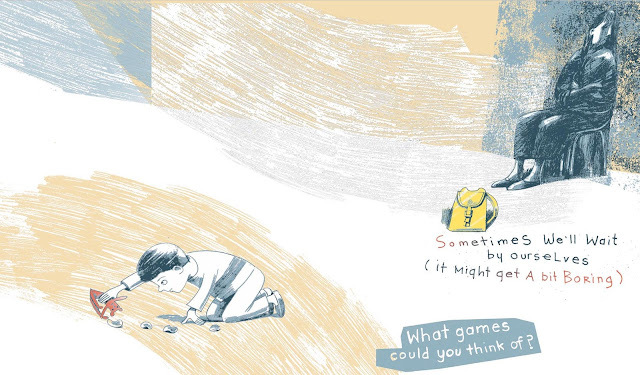 Some of the spreads in the final book have hardly changed since I first drew them. The illustration showing people sleeping on the station platform is an example (see above), it is almost exactly the image I made as soon as I had the idea. 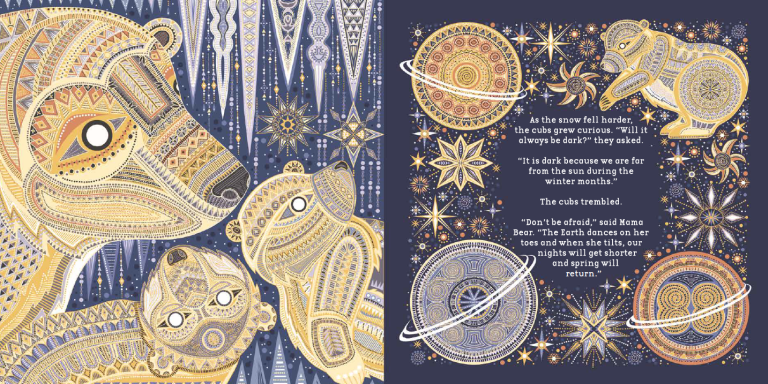 Some spreads, on the other hand, have gone through a lot of changes and below are three early illustrations which have not made it into the book. 1) We'll hear words we don't understand. This was the first example of the idea. I was trying to get the feeling of not understanding anything around you as a child might who finds themselves in a strange country. It’s not just the people who are speaking a strange language, it’s the radio, the dog, the street signs and the magazines, everything is different. Although I still like this image I can see it didn’t fit in with the rest of the book. 2) We'll see lots of new and interesting things. Here is another spread that went through many many changes. The little boy at the centre of the book is basically a cheerful, curious character so, to give a change of mood, I wanted to show him excited about something new. But what should the new thing be? 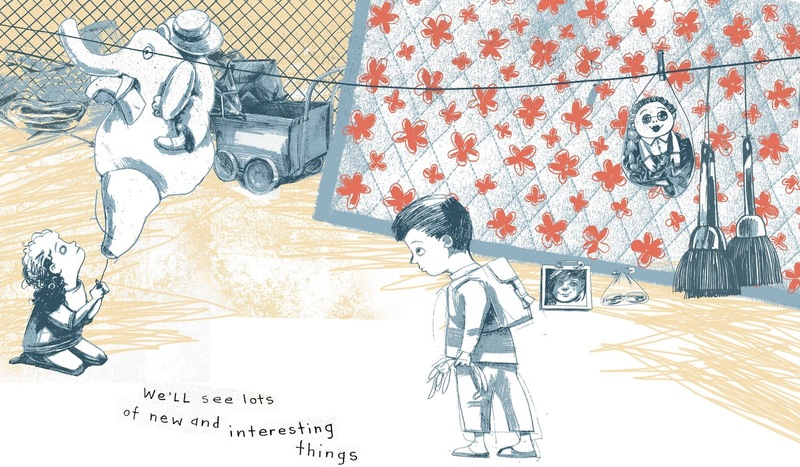 This was one idea which came from looking at pictures of refugee camps on the internet. I could see temporary shops being set up with items for sale wrapped in plastic bags and hung from washing lines. I found this visually very interesting, the sweeping curves of the washing lines, the distortion of the objects through the plastic; I got a bit carried away. Again I like this image but I can see why it hasn’t made it into the final book. It’s my idea of what is interesting, not a small boy’s. I like this image, probably more than the illustration in the final book which is a return to my original idea. However, I can absolutely see why we decided not to use it. The heart of the book is the relationship between the mother and her little boy. On nearly every spread of the final book they are touching, or close to each other, or looking at each other. If she is there he is safe and can look out at the world around him. This illustration does not show that connection between them. 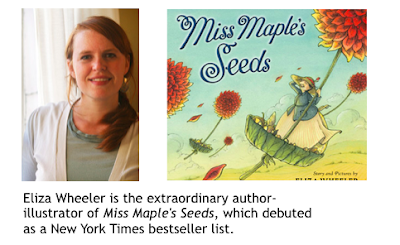 Thank you, Kate, for this wonderful insight into your new picture book, and for showing us that redundancy can be an exciting catalyst to something new. 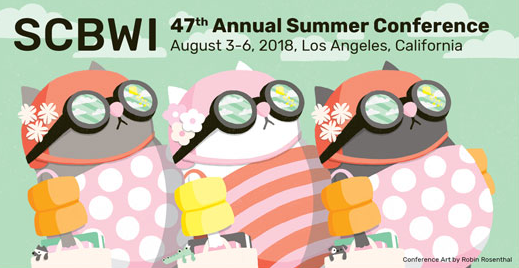 This summer, I had the good fortune to attend the SCBWI International Conference in LA, where for three days, I was one of 1180 attendees amongst the star-studded faculty. 1. Tell Your Inner Demons to SHUT UP! – this was a recurring theme amongst many of the speakers, who reminded us to stay true to our writing and storytelling and to ignore the nay-sayers, the doubting voices. “Kill the committee—those voices in your head that say can't, won't, and other things that get in the way” Andrea Pinkney urged. They DO NOT SERVE YOU. Ah, now that they are GONE, I can begin the real work . . .
2. 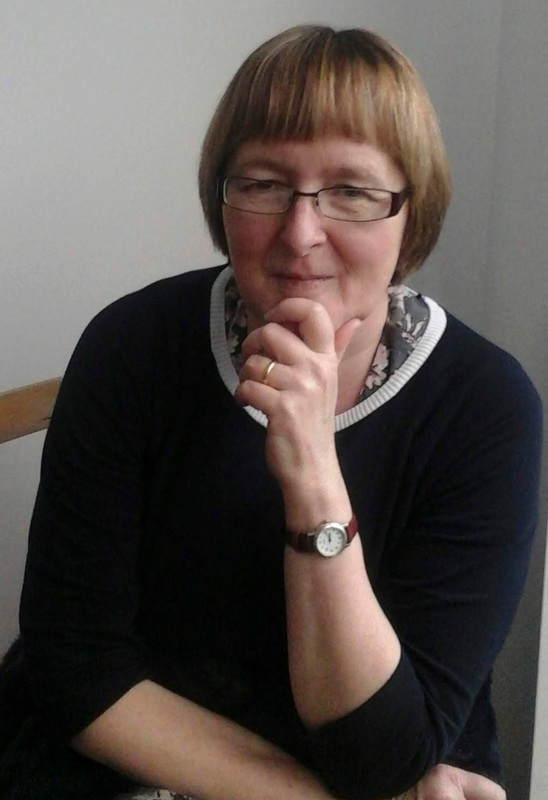 SIMMER: it is important to let your stories simmer, to allow a time, to open your senses, to be still and receptive to QUIET so you can hear the story and keep moving forwards creatively. Andrea Pinkney meditates every morning before she starts work. 3. ‘DIVE AFRAID’: it’s okay to not know what the ending is, where you are going, what shape your story will take on. When you are writing or crafting a story, the reader must also dive afraid – the author is making a covenant and inviting them on a journey. Make that human connection with your reader. TRUST. 4. HOOK, PULL, HOLD: Andrea Pinkney shared her creative process – really useful to keep pinned to your noticeboard as a reminder when you're working: first, hook in readers quickly with VOICE and a clear premise (“Reader, we’re going on a journey – let me tell you where we’re going and why you should come along”). Add texture and flavour, that ‘twinkle’ that is unique to you. Then pull readers along with emotion and a gripping turnkey that will hold their attention until the curtain comes down. 5. 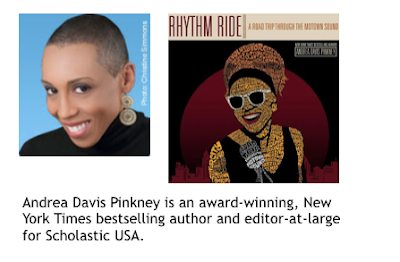 A STORY IS LIKE A RIPPLE IN THE WORLD: You never know how a scene in your book might influence and connect with a reader. 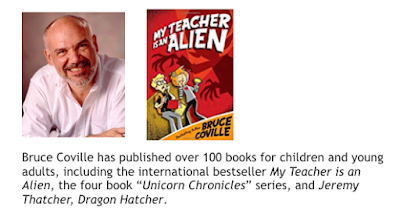 Keynote Bruce Coville said: “The right story at the right moment is like an arrow to the heart; it can catch and hold a hurt and bring it to the surface.” The story that you tell now might send a ripple through the world, a scene from a book could influence the adult that child might become. Children are worth our best efforts. That’s why we do what we do – as crazy as it is most days. 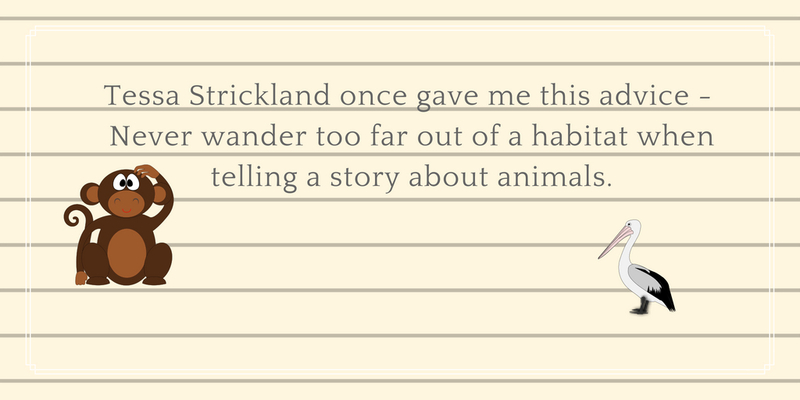 As a storyteller, I love retelling origin stories. I go looking for stories in my own culture and others where the nature is explained in a story full of wisdom. How the sun came to be or why the stars shimmer? Such stories are also full of emotions and life lessons. When I wrote You’re Safe With Me, that was my underlying objective – I wanted to explain thunderstorms in a poetic way while also making it scientifically accurate because science has come a long way since origin stories. Teaching children something wrong like the earth is flat will backfire when a 4-year will demonstrate to me why I’m wrong. But the science between rains and rivers (the water cycle), the thunder and lightning didn’t require much research, I was born in the land of monsoons and I grew up near rivers and oceans. 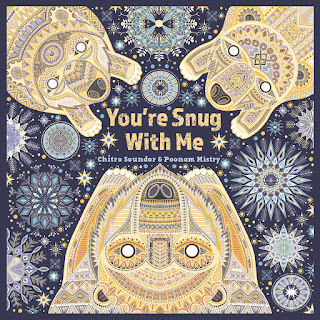 But when I came to write “You’re Snug with Me” which will be out in November 2018, the second book in the series, the story was set in the polar regions amidst a polar bear family. While keeping the words of wisdom of Mama Bear like an ancient storyteller, I also wanted to make sure that the science wasn’t wrong. But I didn’t grow up in a land of ice and snow. Even though the story is fictional and involves polar bears talking, Mama Bear needed to be poetic and factual (but not in an overt way). It would be weird to break the storyteller voice to say "And the world has risen in temperature and the snow is melting at the pace of...."
a) The science of description – I needed to understand the colours of the polar region through day and night, through winter and spring. What trees might grow there and what colours do they exude? Otherwise even the simplest of descriptions would ring false. 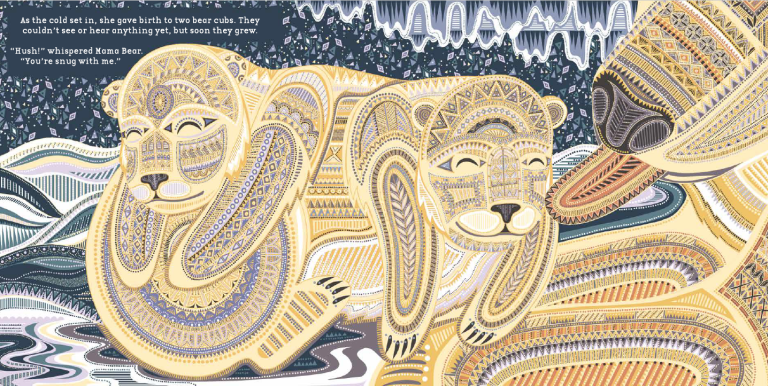 b) The science of sensory details - I needed to understand the touch, smell and sounds of the land above, the oceans beneath and the den in which these cubs spend their first few months. What does snug feel like for a cub that knows only the den? c) The science of habitat – who else lives along with polar bears and what is the food pyramid? What would be the little bears be afraid of and who will be afraid of them? d) The science of climate change – what are the threats to the bear cubs? What do they need to know about their world and in protecting their world? e) The science of growing up – when do the cubs learn to swim? When do they hunt themselves? And when do they leave their mother and lead an independent life? Because it’s a scary world out there and one day these cubs will have to find food and start a new family too. Where did I go for research? I read a lot of original research literature about pregnant polar bears in dens, how they hibernate and what they do inside. I watched videos of simulated dens that some zoos have created. I contacted scientists and researchers who work with these magnificent beasts to ask about their specific facts. Here is a little treat - watch the apprehension of polar bear cubs emerging out of their den for the first time. What was my approach to writing the story itself? a) Do initial research about the topic – that would take me two days of solid reading, getting completely lost inside Google and wandering into research rabbit holes. b) Then I’ll write a storyboard to see if I know the scenes based on my research. 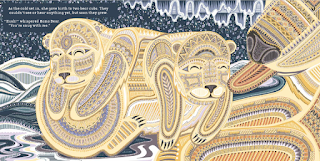 Especially for this book where there is a pattern based on the first book, it was critical to know how many call and response patterns did the Mother and cubs have? d) Then I will start writing the story. If I don’t know a detail, I will make a note and keep going. This is the stage where the rough draft of the text will happen and the structure will slowly emerge. e) Over the next two stages I’ll get the structure right – when is the refrain happening – every two spreads or three? Where do page-turns happen? Will I have sounds or specific patterns of text for each group of spreads? 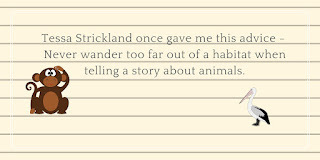 f) Then I go back to do specific research – I need to know about the specific animals I have used in the story or the colour of the sky or the sound of the snowdrift. This will help tighten the words and cut as many adjectives and adverbs I can. Then finally when I’m happy, I send it to the editor, who then after a few edits, will send it to fact-checkers and her own science testers to make sure we have the facts right before we will finalise the text for illustration. When you read the story you will hopefully not notice any science protruding like a jagged rock in the story. The aim is to create a seamlessly joyful story that works because of the science but the facts are woven into its fabric just like nature itself is. Do you research for fictional picture books? What kind of research do you do? And how much of that is procrastination and how much of that is essential? 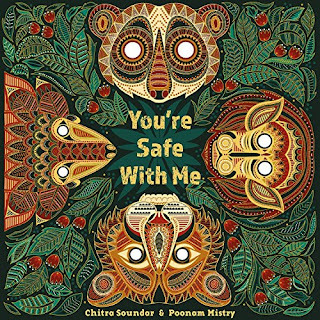 Chitra Soundar is an Indian-born British writer, storyteller and author of children’s books, based in London. When not writing stories or not visiting schools, Chitra fills her well with her nephews, taking photos of flowers and birds, going to museums and attending dancing classes. Find out more at www.chitrasoundar.com or follow her on twitter via @csoundar.